• Размер / Size: 15.43 Мб. Starship Command 2 - гораздо расширенный сиквел к Starship Command с массивным миром из тысяч галактик, планет и империй. Начиная с одного простого космического корабля, продавайте, сражайтесь и пробивайте свой путь к успеху! Версия игры ОБНОВЛЕНА с v170926-0813 до v171006-1952 "Final Alpha". Список изменений внутри. Yay! To celebrate, I'm introducing death! Yes, you can now die, permanently (unless you save scum). But, you can avoid death by abandoning your ship (which also abandons your fleet) or transferring over to another ship in your fleet. 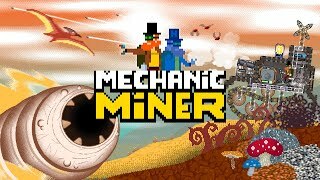 I've also started a manual to help explain the mechanics (and eventually an explanation of files for modding). This is the last build for alpha and this means it's time enter beta! This also means it's time to start charging for SsC2. I haven't decided how much, so I could use your ideas. Beta means, adding features is going to the back and bug fixing, GUI rework, balancing, Linux support, and an in-game tutorial are going to be the main focus. After that, SsC2 will be a complete Minimal Viable Product and I can start work on the other features I want to add, space monsters, empire-sanctioned battles, planetary landings, and so much more. But I need to polish before I add more. As a side note, my current computer is a Intel Core 2 Quad Q9550, 6GB of DDR2 (Yes DDR2!) RAM and a GeForce GTX 750. Or as I call it, the Frankenputer! (Since it's cobbled together from parts bought at garage sales). So it is by no means a beast, or even that great. But, it's been good to work on since I figure, if the Frankenputer can run SsC2, then anyone can! And going further down the crappy computer rabbit hole, SsC2 even runs (not great, but still runs) on an ancient Lenovo X60 Tablet (the old swiveling laptop w/ stylus kind of tablet) which has Intel GMA 950 graphics. (So, if you buy SsC2 and give me money, I can upgrade-That's a word I've not heard in a long time). And if I were to die tomorrow, I'd be sad since there's so much more I want to add to SsC2. But ultimately, after a full year of my spare time, I'm very happy and proud of what it has become. So, engage, make it so, go to the second star on the right, and happy captaining! Almost. It's been almost one full year since the first build of Starship Command 2 was released! For a quick history: For years, I've been toying with the idea of making a starship game that focused on capital ships instead of the WW2 dogfighting space sims (not that they are bad in any way, some of my favorite games are Freelancer, Tachyon: The Fringe, Freespace, etc.) But the game that really caught my heart was the Starfleet Command series. But even Starfleet Command 2 & 3 didn't quite capture what I wanted. So I played around with prototypes while learning programming. About a year and a half ago, I released Starship Command built with Construct 2. And while I'm happy with it, there was so much more I wanted to do with it. Back in February of last year and had an "A Ha" moment of how to procedurally generate starship hulls and spent two months proving it out (and learning C#). When it was working I set out to actually work SsC2. Almost 1,100 hours later (everyday @ 3 hours avg, I work 7 days a week and take care of dogs, so I don't have much free time to work on my projects) Starship Command 2 is closing in on being a minimal viable product! There'll be probably one more Alpha update which introduces permadeath. After that, SsC2 will enter Beta and no longer be free for the full game. The plan is to have a full-feature demo available with saving disabled. So, onto the new build! Turrets are built into the game now for primary weapons. If anyone target is in the turret's "arc if attack" it will need to rotate to actually face the target. Thus means ships that are far away will have less angular difference to compensate for while closer ships can streak by without the turret being able to keep up. Another big addition is nebulas! Nebulas are not shown in the galaxy view but if you are currently passing through one and engage in combat, you'll find the battle field is no longer the black, empty, void of deep space, but a colorful have filled with clouds. Nebulas can interfere with sensor target acquisition and cause shots to miss, or be hazardous and continually damage shields and hulls. You can also now temporarily transfer over to another ship in your fleet during battle. Engines, thrusters, and turrets are now the same color as your hull instead of the default gray. And as usual, I've found and fixed bugs from my "programming". There is still so much more I want to add to Starship Command 2: Space Monsters, actual empire-started battles that you can join in, planetary landings & away missions, enemy ship hacking, detailed fleet management, and so on. But since it's reaching a what's needed for a base game, when I enter Beta, I'll be focusing on polishing, bug-fixing, balancing, adding more jobs. And not focusing on adding new features. So as usual, bug reporting helps me out immensely, so keep them coming in and happy commanding! I'm still hunting down bugs and preparing to do a GUI rework with focus strongly on the shipyards, so any feedback on what could make the GUI easier to use would be great. I've added a save button on the main screen along with an auto-save (defaulted to saving every 200 years). And Auto4X mode now defaults to no FPS cap and will run as fast as possible! Interiors and Ship Boarding are In! 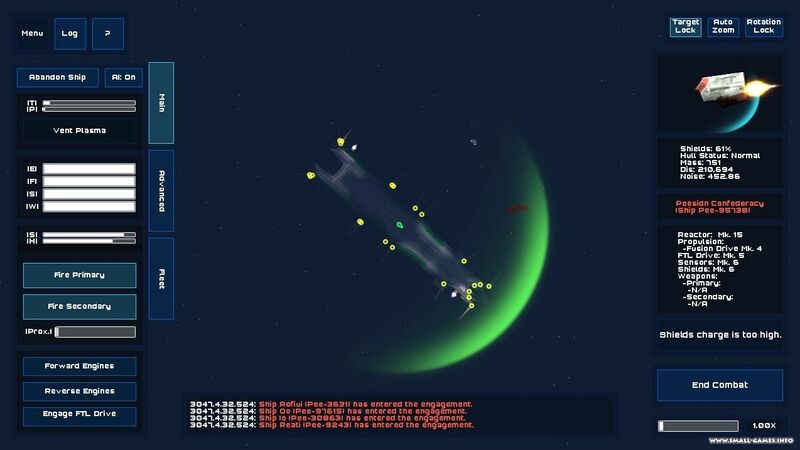 It's very, very rough right now, but ship boarding/capture is working! 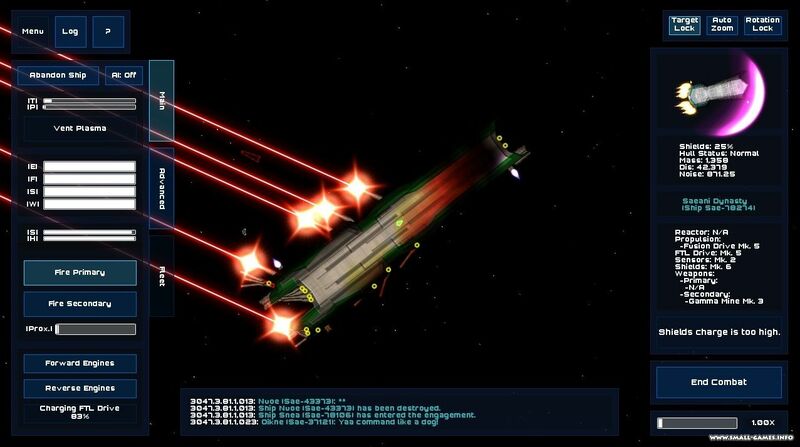 Wear down your target's shields, then beam aboard and slaughter the enemy! Notice the "Board Ship" button is disable because the shields are too high. shipboarding-001 Wore them down! Now we can beam over!shipboarding-002 Take no prisoners! Then take the ship! shipboarding-003 A few notes about ship boarding: First, some interiors will have unreachable areas, for now you can press the "Page Up" key and your crew will "pop" over to the point under you cursor. Second, there are no requirements for taking the ship. You can do so immediately after boarding. Ultimately you will have to go room-by-room and eliminate any hostiles. Since interiors are still in a super-alpha state, I'd suggest NOT playing with them unless you are feeling adventurous. That said, any feedback or bug reports are very appreciated! There is still much more work to be done, such as furnishing the interiors with computer terminals, cargo containers, bed, chairs, etc. and better optimization, bug fixing. Eventually, races will be implemented, so enemies will have different move speed, health amount, healing rate, sight distance and more. But, the basics are in and working. 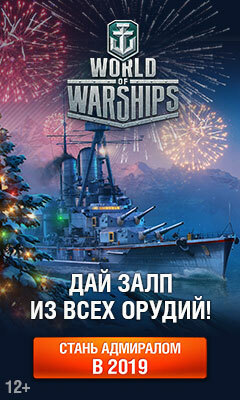 So, go forth and capture some ships for your empire! It's been a lot more work than I thought and with my job getting in the way, I haven't had as much time. So this build mainly focuses on improving the ship AI. AI now uses power more aggressively, so battles will be harder. The AI will fire more often, supply more power to their engines and FTL, etc. Collision are re-enabled but with damage! So, you may or may not experience the enemy try to FTL their way through you. I came across a new empire that SsC2 generated in my testing and I liked them so much, I made them a default! So, interiors are still a build away. But getting there. As usual this build also fixes some crashes. So happy captaining! A new build fixes a localization crash where commas are used instead of periods to mark decimals. Damaged components were being repaired to quickly, so since the repair rate is slower I've upped the strength. New feature: AI ships will now re-target to if they think the new target is more threatening than their current target. Interiors are coming along, but still need more work to be able to release. So hopefully, they should be in the next build. Bug fixes, and new camera options and smooth-zooming! New build introducing asymmetrical hulls, weapon charge indicators, crash logging, bug-fixes and more! New build includes captain, hull and planet naming, advanced sub-system control, comms and more. This builds introduces secondary weapons, empire farming, tech proficiencies and some bug fixes. Fixed a few bugs, included crashing when buy hulls & weapons. And major performance improvement when processing empires. The difference between a primary and secondary weapon is that the primary weapons charge directly from the power supplied from your ship's reactor. Secondary weapons use ammo and create an explosion. First is the ability to fund a shipyard's construction in your empire's sectors. And when you FTL drive reaches max radiation accumulation, it will no longer stop outright. Instead, it's speed will keep decreasing until it is at 1% of its normal speed. This makes expansion more interesting, as the empire's territory becomes more "shaped" then just a ever-increasing circle. Second and most importantly, is for when combat is introduced, this gives the player a direct focus to cripple an empire without having to attack each sector individually. Size is the shipyard's hull size. In the picture, one shipyards has a hull size of 1, the other has a hull size of 2. Speed - How fast you can travel to your destination. Strength - Every time your hull is hit by weapons-fire, a component has a chance of breaking down. Charge Time - In tactical combat, how many seconds it will take at full power & strength to charge. Power Requirement - How much power is required to charge the FTL drive in minimum time. Mass Reduction - Another tactical combat property, this is what percentage your total ship's mass is reduced by. Making your ship respond that much faster. Radiation Accumulation - In the galaxy view, whenever you are travelling, the FTL drive "picks up" radiation. FTL Radiation AccumulationWhen it reaches max, the FTL drive will shut down to vent off the radiation. This can be quickened by pressing the FTL Radiation button:FTL Radiation OverloadOr the radiation can be removed immediately by visiting a shipyards. The undiscovered sector graphic has been changed so there will be less "white-out" for large galaxies. Fixed an error when an empire surrenders, that the surrendered sectors were not counted into the winning empire's count. Last version (Starship Command 2 (Alpha Build 161020-1334)) would eventually get stuck in an infinite loop due to the weapon-point calculation. Because of this, and the fact that weapons are not fully implemented yet, this bug fix disables the calculation (which will be fixed later). Major update today for SsC2! Shipyards are now in place. This means you can buy new/trade-in components in your fleet (as of right now, only hulls are implemented). Implementing this meant fixing a few bugs and tweaks to the hull generator code, mainly to calculate available cargo spaces based on the empire's economic priority. travelLogImage This will, by default, keep track of your last five stops. Another major change in terms of gameplay, is the added penalty of new governor claims. The cost of claiming a new sector as a governor, is multiplied, again by default, by the amount of already-governed sectors. This was to keep the player from just claiming every sector on the cheap. Adding this meant the player would have to be able to relenquish his governor's claim. Doing so will sell the claim to your empire, the value of it is based on the development of the sector. This introduced real-estate flipping! Claim a sector, buy and sell in the market, then immediately sell the claim. During testing this became game breaking as I was able to gain 4 billion credits in under a game-year. So, to squash this game-breaking "feature", a cap was introduced to increasing sector development by market trading. All these values can be changed in the settings file, so if you want to be a space-real-estate mogul, just change the settings. Early alpha build for October 15th, 2016, 7:59 p.m.
ADDED: New captain screen now shows the base hull shape of the selected empire. 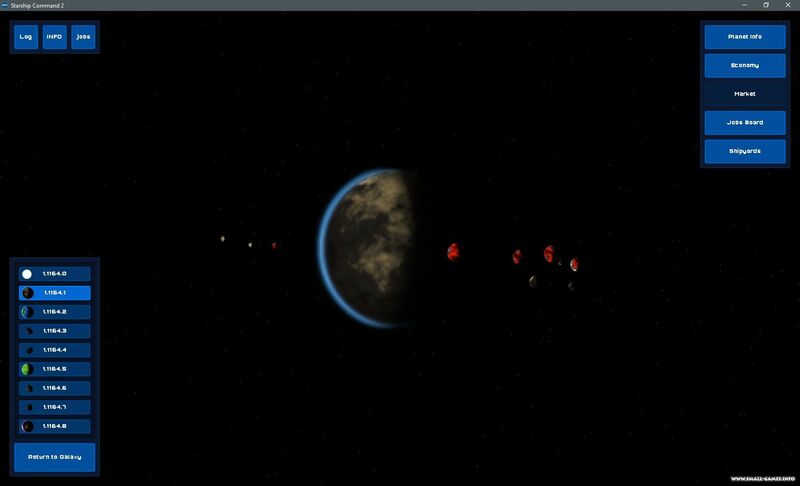 Early preview build, galaxy generation, empire relations, sector economies are working. To install, simply unzip and run "Starship Command 2.exe". To clear the galaxy, go to "/Data/Mods/Standard/save/" and delete everything in it. 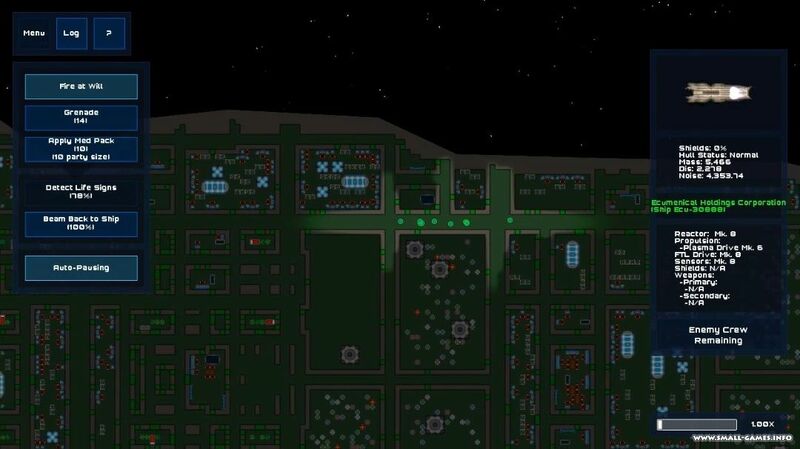 Starship Command 2 is a much-expanded (and currently in alpha) sequel to Starship Command, a persistent-world, massively single-player, real-time tactical starship simulator wrapped in an AI-driven 4X game. 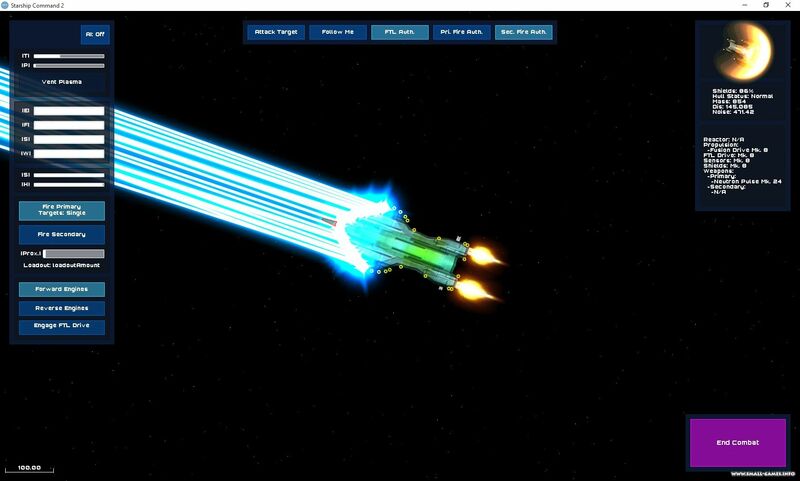 Starting with a lowly shuttle, you will trade and battle your way to victory, amassing a gigantic fleet customized to your liking! What Is Meant by Massively Single-Player? Massively Single-Player means when you start Starship Command 2 the first time, it will generate a galaxy with thousands of sectors, each with their own planets and economies. Then populate the galaxy with AI-controlled empires that will attempt to conquer every sector. The galaxy persists through every captain you play as. And you can swap between multiple captains and play both sides of a conflict. The empires will create wars and alliances with other empires, and even break out in civil wars. Take command of a starship! (or a fleet of starships). Build a fortune by trading commodities, completing missions, collecting taxes from sectors and battle the other empires for glory! 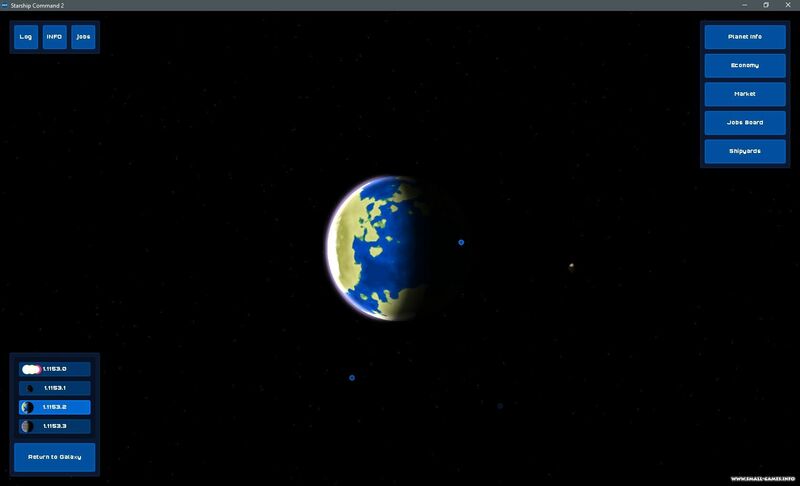 • Hundreds of empires (hand-crafted and computer generated) to play. 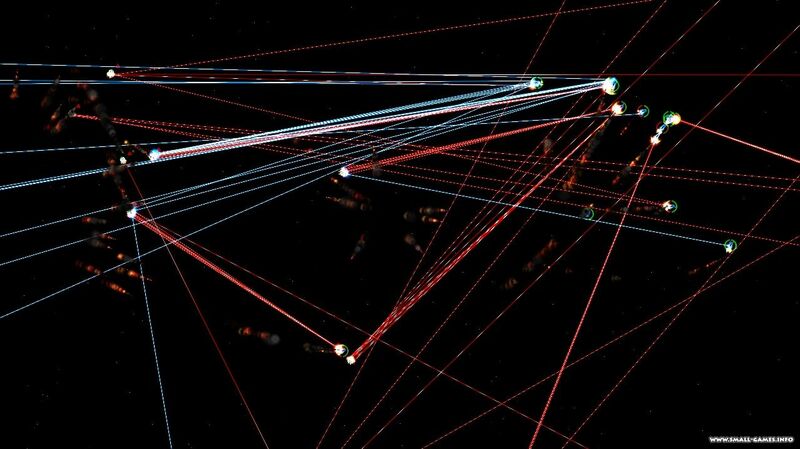 • Thousands of sectors to colonize, trade with or attack. • Automated captain's log generation will note actions taken by you and later save the entire log to a file. • Persistent galaxy that stays through all captains you play as. 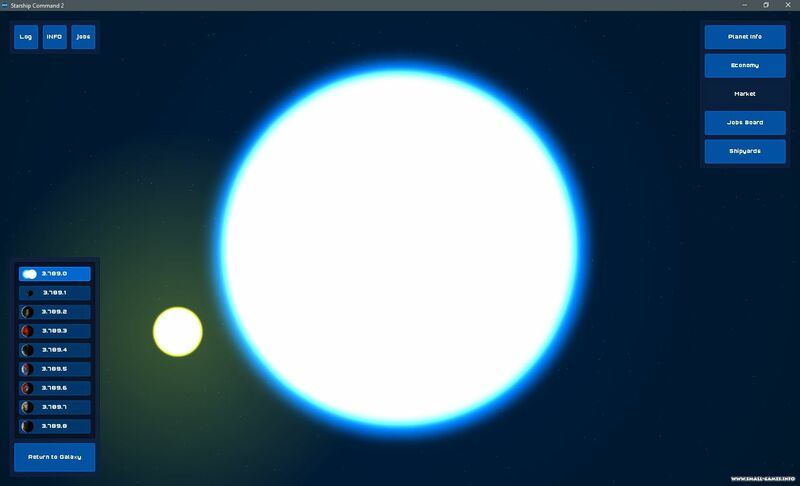 • Galaxy generation - All galaxies are based on moddable JSON files. • Moddability - In fact, all files are either JSON or PNG, making the game mod-friendly! 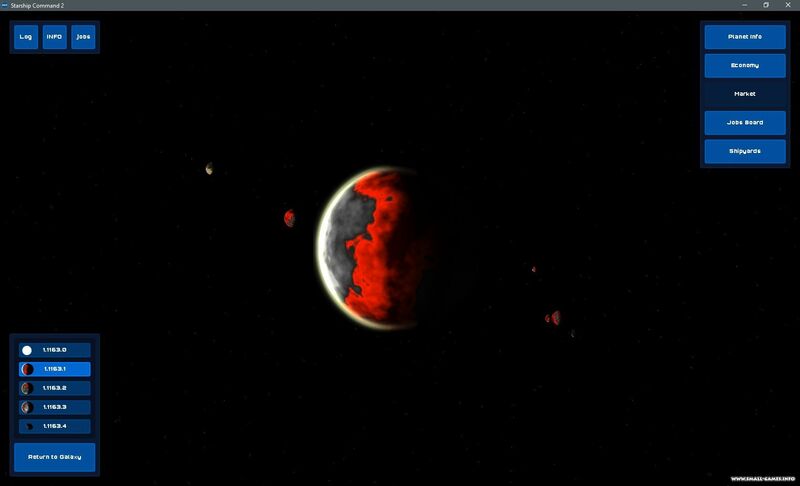 • Empire AI - All empires will act & react to other empires, creating a dynamic galaxy that can span thousands of years. • Economy - Trading commodities between sectors and colonizing sectors. • Captain's Log - Working, but still needs polishing as more features are added to Starship Command 2. • Randomly-created ship hulls and components - This is working as an early-prototype which can be seen and played with here. 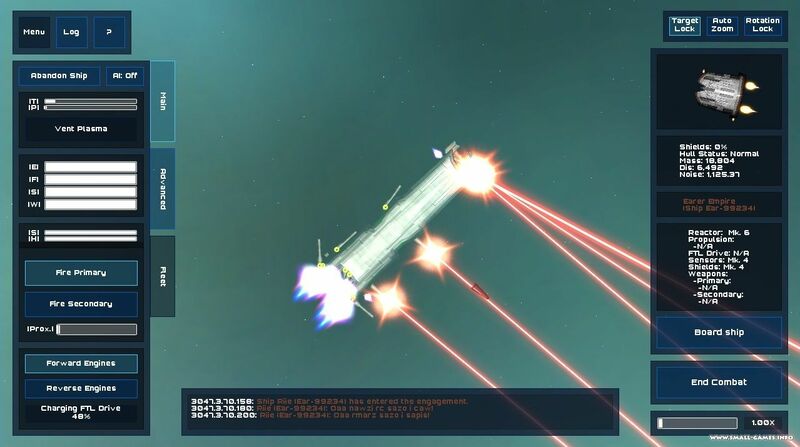 • Massive real-time, tactical, space battles - Possibly hundreds of ships battling, while balancing power usage, shield sections, weapon and shield frequencies, etc. 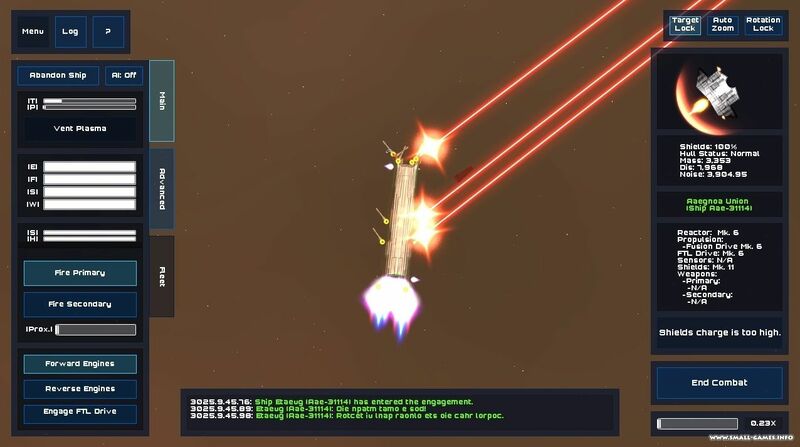 • Ship-boarding and capture - Beam aboard enemy ships and capture or sabotage while the battle rages on around you. • Job boards and scenarios - Standard jobs, such as take me here, bring this here, kill this guy, etc. 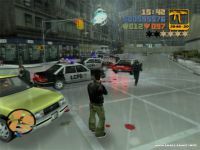 scenarios such as moral dilemmas, logic problems, nemesis-battles, space-monsters, empire super-weapons, etc. 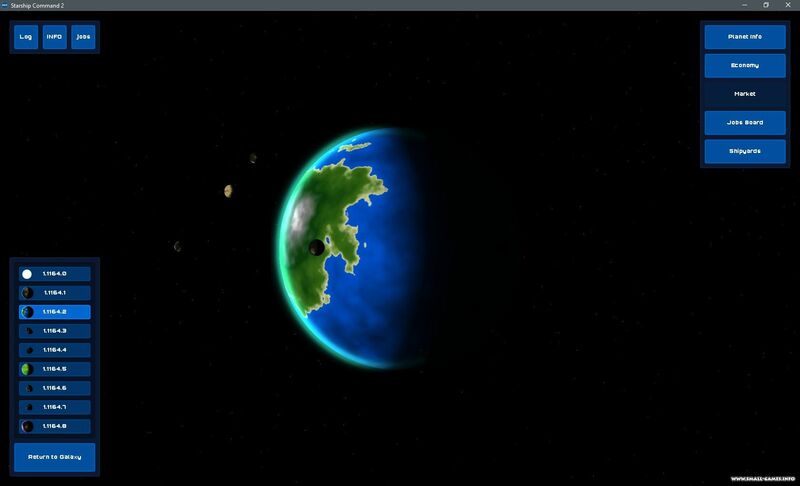 • Planet exploration - Beam down to a planet and explore the terrain, people and animals. Если ты нашел новую версию игры Starship Command 2 v171006-1952 [Alpha], либо русификатор к ней, патч, левелпак или мод - сообщи об этом редактору новости, он добавит сюда доп. файл. Мы стали гораздо более расширенными! Как уже сказали, постоянные краши из-за любого нажатия, нет обучения, сложный геймплей, игра 0/10, даже прототипом это сложно назвать, не стоит качать! Разобравшись из разряда "Что єто не знаю от чего зависит - тоже"
Есть много секторов, не занятых. Каждая система имеет что-то из разряда "Тел"
От чего зависят цены на товары в маркете не понятно. Понимаю лишь что купил дорогое, улетел куда-то, продал в 10-100 раз дороже. Для чего эти товары, Зачем, Что с них сделать можно? Есть кто может помочь и обьяснить? Часто сравнивают этот проект с EVE. Задумка авторов и правда в том, что бы сделать в итоге "облегчённую" двухмерную версию этого многопользовательского космосима, но пока что до этого как до луны. Сейчас в игре адекватно можно только летать, покупать/оборудовать корабли и в общем-то все. Торговля и экономика реализована слабо, миссии и планетарная деятельность тоже. Да в общем-то сейчас это просто леталка-стрелялка с кастомизацией коробля. Несмотря на это, следить за проектом стоит. Думаю что в нее интересно играть , но автору кто залил эту игру на сайт видимо было очень сложно ее перевести даже через google . Жаль что ему лень это делать ! Очень даже годно. Если посидеть и немного разобраться, игра затягивает.